For purposes of this digitization project, a definition of a chapbook is required. Glaister continues his definition and provides a timeframe for these publications. London printers began to print chapbooks at the end of the 17th century and they continued to be published until the 1880’s, when the Catnach Press went out of business. Carter states in his definition “not in current use since about 1830”. In America, the chapbook era was from about 1725 to 1825, however in the McGill collections we have chapbooks printed later than 1825. Chapbooks are also called penny histories. They were originally created as popular literature for adults, based upon medieval romance, English legends and folklore. 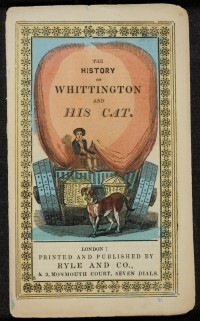 Children’s chapbooks were later produced with popular nursery rhymes and fairy tales. Glaister, G. A. Glaister’s Glossary of the Book. 2nd ed. London: George Alen & Unwin, 1979, p. 92. Neuburg, V. E. The Penny Histories. London: Oxford University Press, 1968, p. 75. Carter, J. ABC for book Collectors. London: Granada, 1980, p. 57. Over nine hundred British and American chapbooks published between 1780 and 1878 from the McGill Library’s Rare Books and Special Collections have been digitized. The collection has been catalogued and can be viewed in the McGill Library catalogue using the following link – http://catalogue.mcgill.ca/F/?func=find-acc&acc_sequence=022866705.